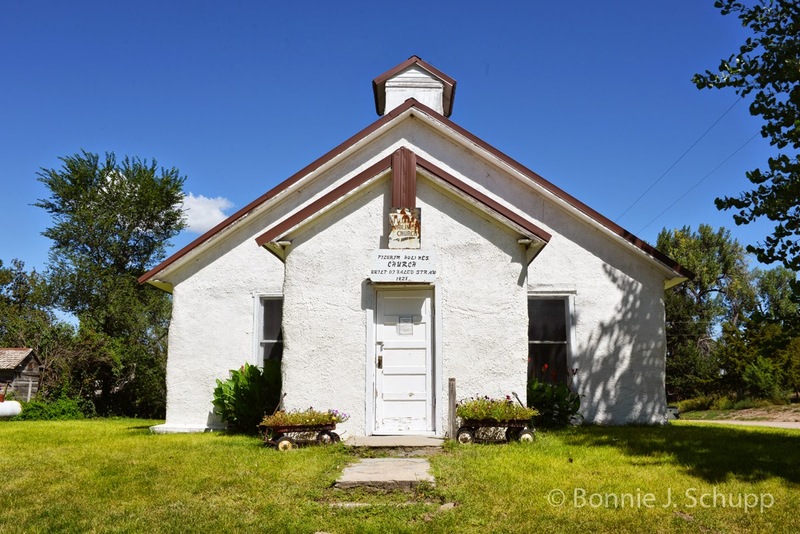 ARTHUR, Nebraska – It’s not exactly the church around the corner, but the Pilgrim Holiness Church is a must-visit kind of place. It was made of hay bales in the late 1920s, and survived the possibility of being eaten by cows with coatings of plaster and stucco. Arthur has a population of maybe 200 – “more at night than daytime,” jokes the town’s busiest octogenarian, Don Thompson, just done mowing grass in the local cemetery. Don found us walking around the old white church, where Bonnie was taking pictures. We were easy to find. Probably everyone in town knew we had come through in the red Camry with those flashy Star-Spangled Banner bicentennial tags from Maryland, but hardly unique as travelers drawn by their religious oddity. Our instant tour guide drew a cluster of keys from his pants pocket. “I think I have the right one,” he allows, slipping the silvery key into a padlock that keeps out intruders – not that such a tiny place would have a church burglar. It clicks open. 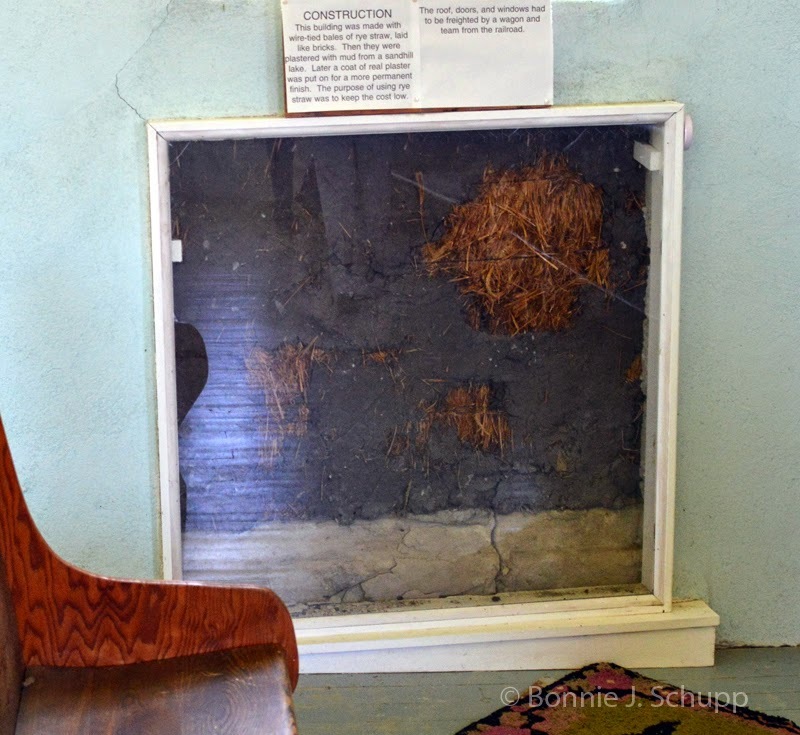 Don Thompson sits in front of the double row of pews (above), and the wall opening that reveals hay behind the plaster. Inside, although the church hasn’t been used for services in many years, are two neat rows of wooden pews, and a fading print color image of Jesus looking out from the wall behind the pulpit. Don shows us an opening in the wall (photo, right), revealing a section of the straw under the plaster. Then he leads us to the front and sits down at an old player piano – not original to the church, but donated to the landmark by a relative. He pumps a foot pedal and the roll of music begins to turn, cranking out a hymn. Bonnie – a church organist in her teens -- takes the seat and plays “Jesus Loves Me,” and Don (click on video, below) begins singing. It’s so incredibly timeless, this moment in the house of worship. Bonnie plays the old piano, and Don sings the hymn. lots of patent medicine bottles. And upstairs, more furnishings – some from the church, others, like an early Singer pedal-operated sewing machine, brought there after their owners passed on. Don opens a couple of the little square drawers in the machine’s table, and there are the old bobbins and needles in perfect condition. Time has taken a toll here. Ceilings and walls have stains and cracks, there’s dust and cobwebs. Spiders go about their business, seeming oblivious to passers-by like us. 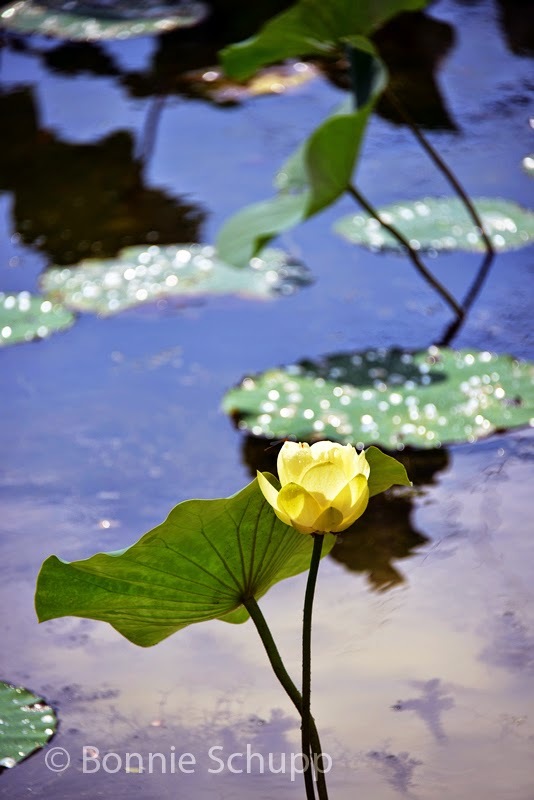 Life goes on here, just not necessarily the human part of... dare I say, God’s creation. As we’re chatting, and Don checks in by cell phone with his wife Helen, we learn that they’ve been married since New Year’s Eve of 1950 – eligible for Bonnie’s Together 40-Plus photo-and-words project examining the glue that holds people together for so long, first with a single word (other than “love”) and then a short explanation for that choice. 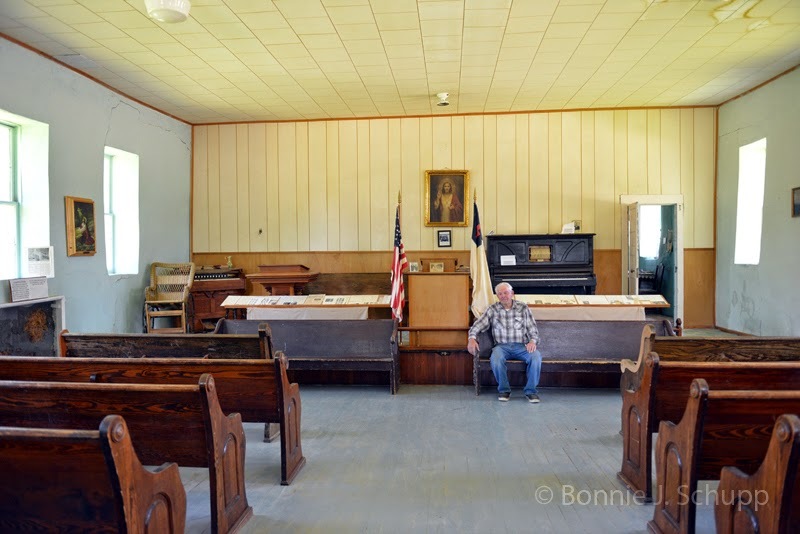 He invites us to their home, but on the way we stop for a look inside what “Roasdside America” lists as the world’s smallest courthouse. Don has the key, of course – the same one from the church. The wooden 1914 building served as the Arthur County courthouse, and offices of the county clerk and commissioners, until 1961 – and, wouldn’t you know it, Don Thompson, at 83, is the sole survivor of all the commissioners who had met there for nearly half a century. A neatly typed sheet lists all the names and dates, and there was Don in the last group of three names. There’s all manner of records and bric-a-brac sitting out on counters and tables, like old typewriters, a safe (its door removed, but lying atop it), newspapers (Warren Commission report released, Challenger disaster... historic events, but dating after the courthouse was replaced by a bigger, more modern building mere steps away). A set of shelves holds records from the local public schools dating to the 1890s. 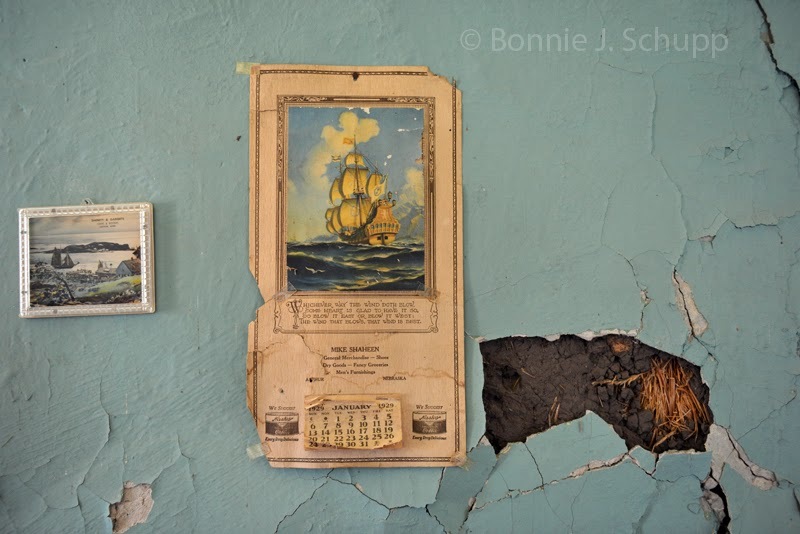 It’s a dissheveled, but fascinating, museum – frozen in time, just like the church. And then there’s the old jail. The little wooden building, a shack really, was missing the expected padlock on its heavy wood door. Maybe folks don’t go out of their way to break into a jail. 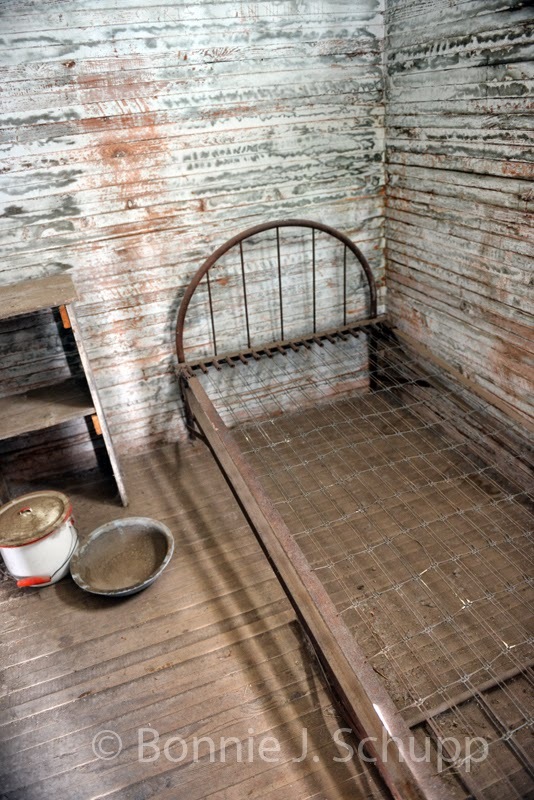 But Don told us there was one inmate many years ago, a neer-do-well named Lemuel, who tried to break out from one of the three tiny wooden-slat cells. .e got into the outer room and banged on the inside of the heavy door, possibly with a piece of metal from the wood stove. Don couldn’t remember exactly what was used, but pointed with pride at the slight gouges that remain from the pounding. As for Lem, someone noticed the noise and foiled his escape attempt. Eventually, Don said, someone shot him. Maybe he’s in a better place? Probably not. 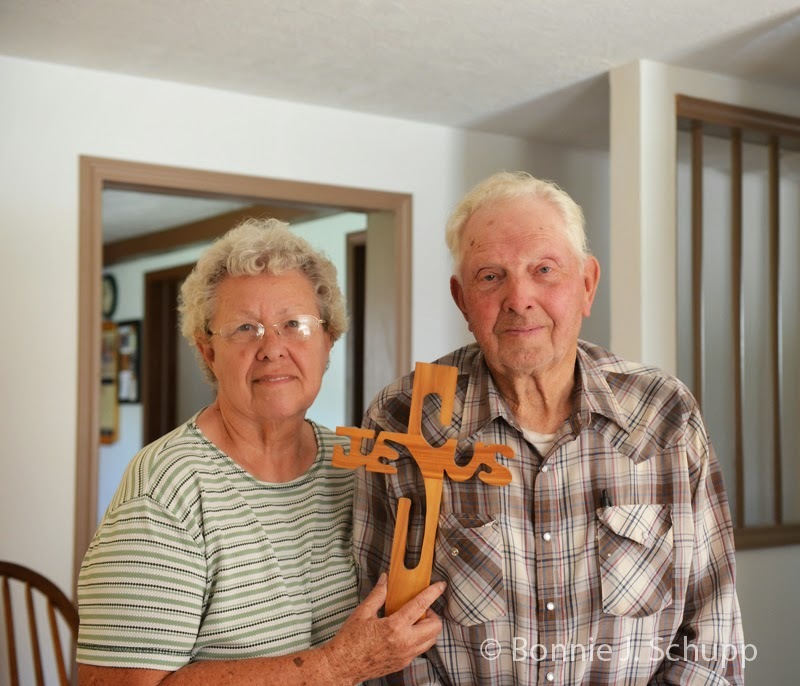 The Thompson house, which Don himself enlarged after Helen wanted to move into town from their 400-acre ranch some 12 miles away, is heavy adorned with Christian displays and photos of their large family. They have four children (three boys, one girl), eight grandchildren (all but one of them girls) and seven great-grandsons. 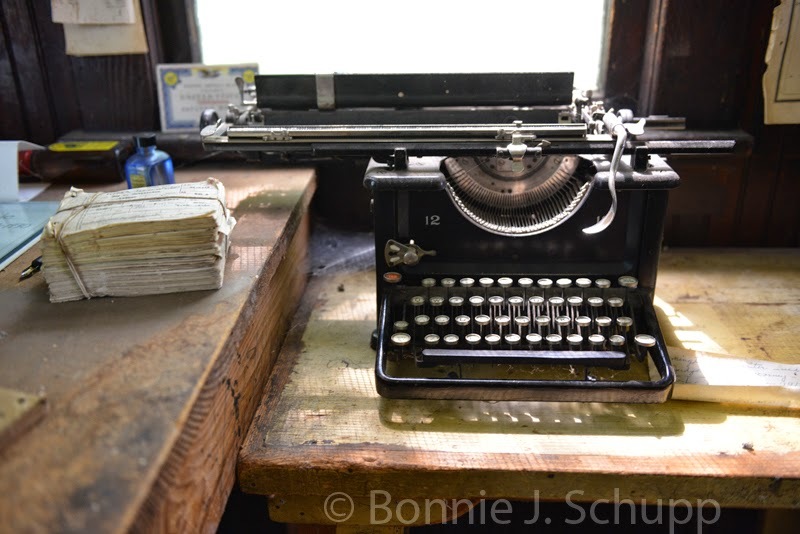 The modern kitchen is Helen’s domain, and she’s talking with Bonnie and inviting us to stay for an early-afternoon dinner that’s on the stove, while Don takes me into his domain – a cluttered office packed with his shortwave radio equipment. Don has been on the airwaves since the early 1950s, even built his own 100-foot transmitting tower out on the ranch. He’s also been a pilot, as co-owner years ago of a family airplane, still works as an electrician, digs the graves and buries the dead, and even works for a nearby county as a part-time roads inspector. One of his paintings, of the little ranchhouse where he was raised, is hanging along with many souvenirs and awards on the wall, near a drawing by a granddaughter of Jesus on the cross. Don also allows as how he’s been a writer, even selling some of his stories. As I said, he’s rather busy for a country gentleman of 83½ years. Helen sets up a card table in the living room and Bonnie helps open a set of folding chairs where we sit down to a supper of homemade meatballs and gravy, with macaroni salad, corn, and bright red and yellow varieties of fresh tomatoes. We hold hands, and Helen offers a prayer of thanks for the food, and for us visiting them. Don and Helen (left), pictured for Bonnie's project. Religion is her strength. 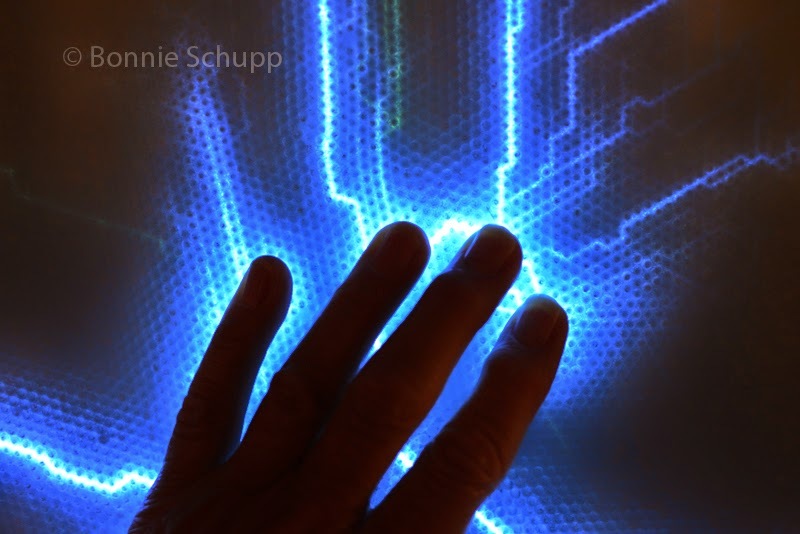 And, for Bonnie’s project, it is also her word. Her explanation is much longer than Don’s, but at its essence, she says, “Jesus Christ is our mainstay. All of our children go to church.” And there’s great pride and inner strength in her faith. Our lives and feelings about religion are vastly different. But here in America’s heartland, some 1,600 miles from home, it’s good to look at the place of belief from another, very real, point of view. From tiny Arthur, we hit the road for about 90 miles north and west, along scenic Route 2 through the Nebraska sandhills – seeing plenty of rolling hills of grasslands but hardly an ear of corn. This is cattle country, where many ranches are measured in thousands of acres. We had the railroad tracks to our right, and about every 30 minutes a long eastbound train would pass us, hauling cars loaded with Wyoming coal. Carhenge, and a perfect Nebraska sky. Carhenge... America at its whimsiest. 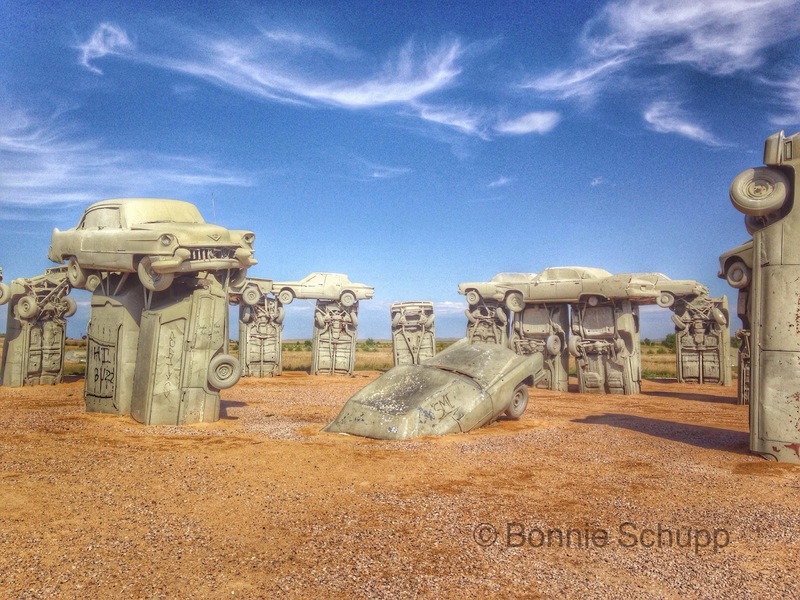 Our destination was Alliance, home to that oddest of tourist attractions in this huge state: Carhenge. Doubtless you’ve seen it pictured, the old cars partially buried nose-first in the ground, and others balanced and wired atop them in imitation of that other “henge” in England. A town museum video on area history from native American roots to the 21st century took note of Carhenge, putting the number of visitors at some 87,000 a year. And small wonder, because it’s hilarious – the cars, and whimsical sculptures mostly crafted from car parts and an occasional chassis. 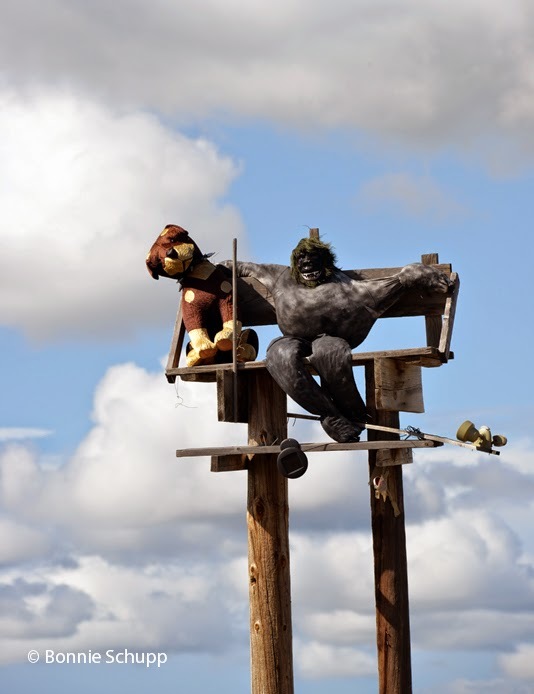 Carhenge was created in 1987 by engineer Jim Reinders as a memorial to his father on land once farmed by his family. It has grown in recent years with art-car contributions by other artsy folks of similar quirky bent. Whether one might call it a spiritual invocation or spoof of the American auto industry, no doubt about it being art. It is very much in the spirit of Baltimore’s American Visionary Art Museum. On our second day, Saturday, we explored the sleepy town. Most shops along Box Butte Avenue, the historic business district, were closed. The impressive-looking Alliance Theatre movie house, dating to 1937, was the brightest spot – but not open until evening. We drove about half a mile to find Central Park, graced by among other attractions a spectacular fountain, an arboretum (closed, but beautiful outside gardens accessible), and the Knight Museum Sandhills Center. Named for a town doctor who became one of its most successful businessmen, and left money to build it, the museum has a large collection focused on regional history and fascinating artifacts. We luckily arrived on one of the final days for a traveling show of photographs of native Americans from the late 19th and early 20th centuries, which complemented the museum’s display of native art and lifestyle relics. When we arrived in Nebraska about four days earlier, it was a world we knew little about beyond its flat corn country. Now, as we prepare to leave for South Dakota, it’s like an old friend... albeit, Republican. We’ll miss it, and the kindness of strangers who casually greet you with a “good morning” as your turn the aisle past them in the Safeway supermarket. 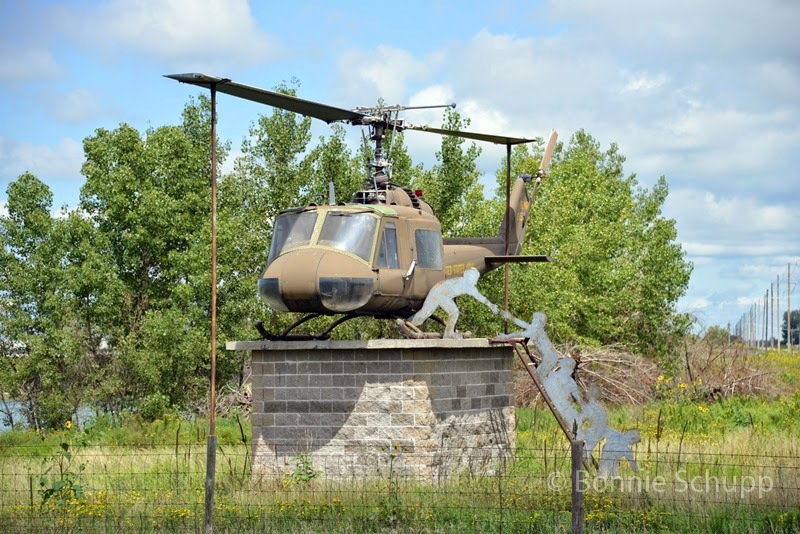 LEXINGTON, Nebraska – The last helicopter out of Saigan catches you by surprise, the sight of a helicopter atop a platform where a figure with hand outstretched reaches for those fleeing in the last moments of the Vietnam war. And it’s in the middle of Nebraska, of all places. 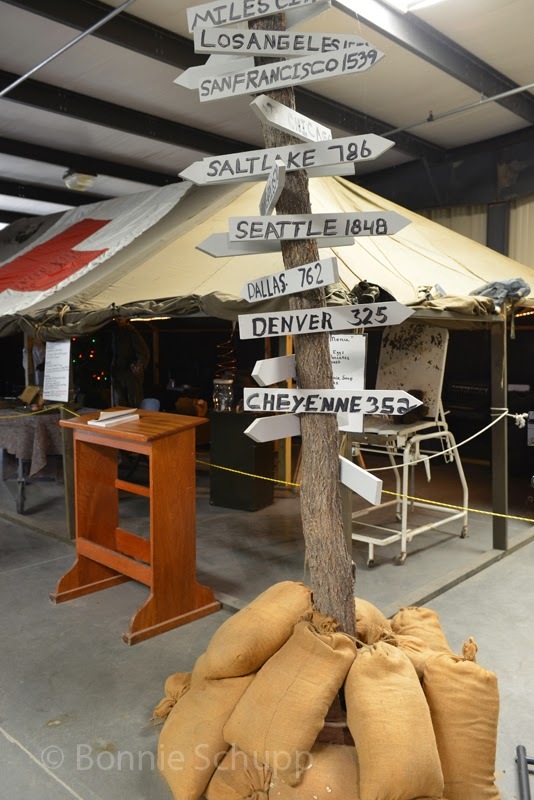 Just off Interstate 80, about a quarter-mile east of the Lexington exit, the display is part of the collection of the Heartland Museum of Military Vehicles. There’s about two dozen military vehicles and pieces of equipment baking in the sun, and rusting, outside a warehouse-size building filled with the stuff of military history dating to the first world war. Helicopters, jeeps, ambulances, trucks, armored personnel carriers -- the hardware of war – fills nearly all the floor space. 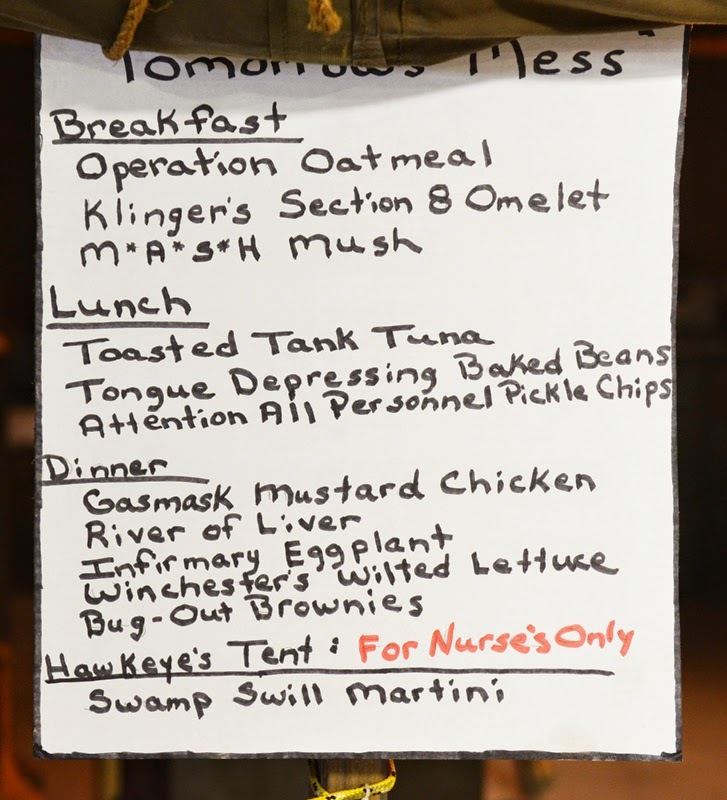 There’s even a large Korean War-style MASH tent -- Mobile Army Surgical Hospital – depicting the setting of the legendary television program M*A*S*H* that put the acronym into the mainstream vocabulary. A posted menu offers some tongue-in-cheek dishes. Our guide through the museum is one of the volunteers, Gary Gifford, himself an Army veteran of Vietnam. He points out the most unusual pieces, like a restored troop truck built shortly after World War I, and a helicopter still in flying condition. Many of the pieces could run, and some have participated in parades, he noted. 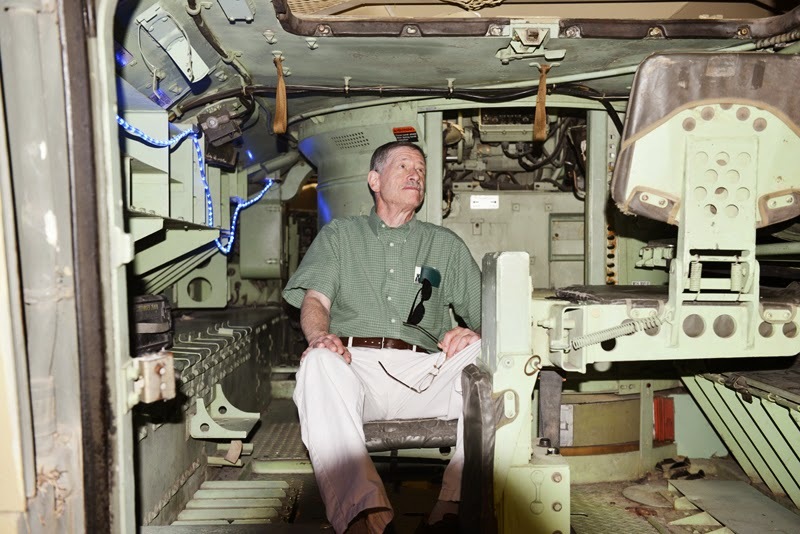 He led us to the backside of a combat tank, where visitors can clamber inside, take a seat and imagine how hot soldiers must have been when riding in one. It’s not like chilling in an air-conditioned car set on cruise control. It is among several pieces in which visitors can sit or climb around. Another is a former Huey gunship helicopter. There is an open area in the building where local Veterans of Foreign Wars meetings take place, and a large display of tri-folded American flags – presentation flags from the funerals of veterans, customarily handed to the next of kin. The flags had formerly been housed in a veterans club that closed, and they were moved to the museum. Each of the stacked, triangular wooden cases has a name tag. They are the real centerpiece here. Admission is free, but donations are welcome – along with grants, they are a major source of funding for the museum. Interstates will get you there fast, but most often it’s the blue highways that bring the best smiles. Getting off I-80 in favor of the two-lane asphalt ribbon of State Route 30, we rolled into the town of Gothenburg – home to a surviving station of the storied Pony Express. The station was moved to the site, now part of a pleasant town park, in 1931 from its original location along the National Historic Trail route of the daring, perhaps foolhardy, riders. It was a business that lasted only about 18 months, providing a means of communication between Missouri and California through a relay of mail delivery riders -- an early example of how quickly technology can render a business obsolete. In this case, it was the telegraph. But the little museum/souvenir shop operating inside the restored station, and a silhouette rider a few steps from the building, help keep the romance of the Pony Express alive. It also sells lots of books – and (hint, hint) could use some more copies of our friend Chris Corbett’s book, “Orphans Preferred: The Twisted Truth and Lasting Legend of the Pony Express.” It was sold out. As we continued westward on Highway 30, enjoying the sight of millions of black-eyed susans (also called wild sunflowers out here), the blaring horns of trains hauling mega-tons of coal eastward, passing an occasional abandoned homestead fallen into ruin, we came upon a large stuffed animal gorilla and dog sitting side by side on a bench, mounted atop a pair of old utility poles in the rural community of Paxton. The sight was worth stopping and turning around, to admire the whimsy and wonder at the why. I steered onto a dirt lane and drove between fields of tall corn in search of the folks who lived there. But no one seemed to be home when I rang the bell – only a curious pooch that popped through a little doggy door onto a side porch, with nary a bark. The roadside mailbox bore the names of the folks who live there, Randy and Cher, and if I manage to contact them I’ll update this yarn with their explanation. In any event, thanks for the laugh! 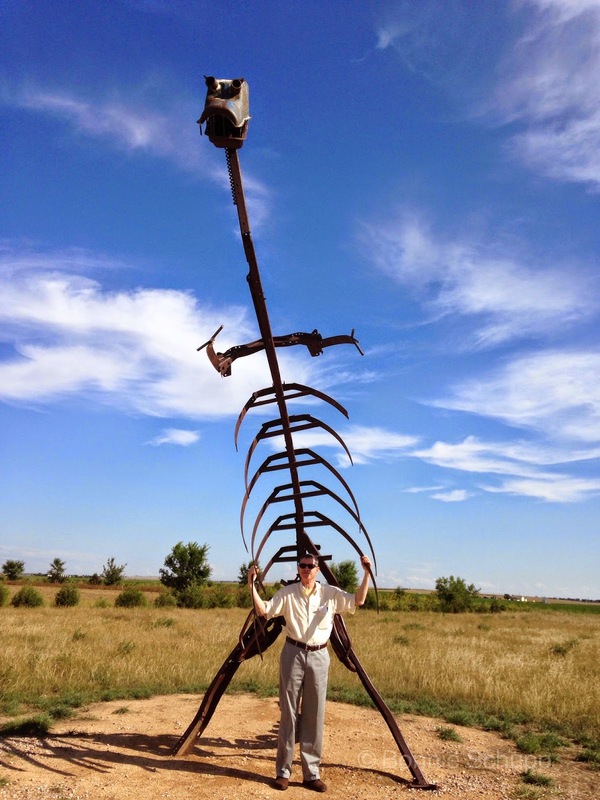 CLAY CENTER, Nebraska – Some folks take a trip go to the beach, some to the mountains. But Bonnie and I go for the strange... like this week, for instance. We toured the U.S. Meat Animal Research Center. It’s not for everybody’s taste, this 35,000-acre spread in mid-America (or, if you’re from the Baltimore area, think of it more as the Middle of Nowhere, a good 25 miles south of Interstate 80). 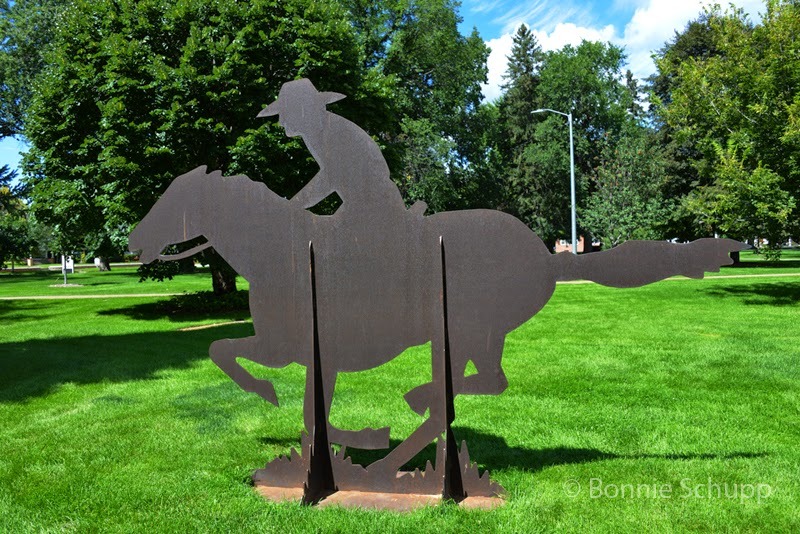 From what Bonnie found in surfing the Web for the places most folks don’t go, most of its visitors are in the agriculture and ranching business. Complain about big government all you want out here in the extra-rare Red States, but if you’re raising cattle, sheep or hogs, the folks who work at MARC (not to be confused with the Maryland rail commuter acronym) are helping you. Its staff of scientists and technicians are conducting experiments to determine the best strategies and genetics to grow meat animals efficiently – what and how much to feed them, when and how best to breed them, how to assure the birth of the hardiest calves, lambs and piglets, and what practices produce the most tender meat. Sorry, PETA. As I’ve said before, I love animals... some of them especially so, medium rare. I know, PETA pals – it stinks. And this place stinks. There’s enormous amounts of manure, and it is managed almost as closely as the animals. It fertilizes thousands of acres of fields growing government corn, soybeans and alfalfa for their feed. 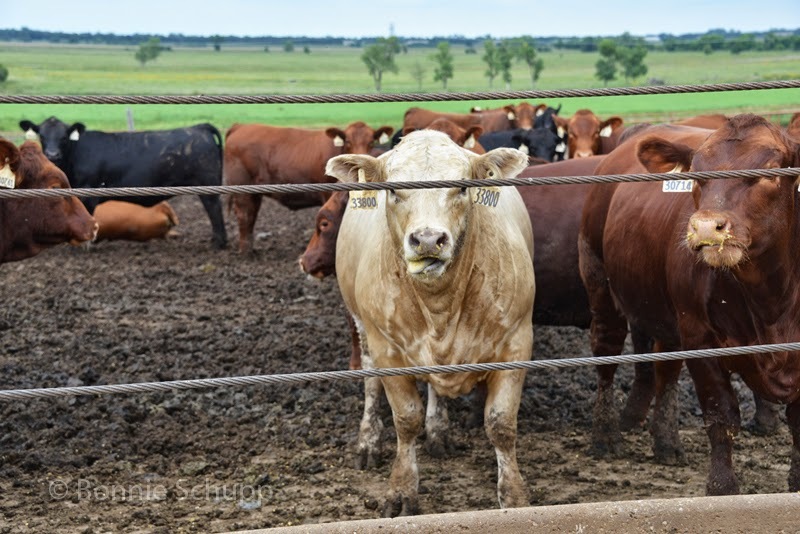 The facility is named for Nebraska’s late U.S. Sen. Roman Hruska, a conservative Republican, and this year marked the 50th anniversary of the congressional act approving the transfer of the property – formerly a naval ammunition depot – to the Department of Agriculture. It opened during the Nixon administration. We showed up at the administration building unannounced about 2 p.m. on Wednesday, Bonnie noticing only minutes before our arrival that reservations for tours are requested. But after pulling into one of about three visitor parking spaces, we were warmly greeting by a receptionist in the lobby, filled out a visitor registration form, and had to wait only about 10 minutes before a guide was found to give us a private tour. One problem is that visitors cannot drive or walk unescorted around the huge property and its many dirt roads. So we climbed into the dusty old work truck next to veteran cattle manager Wayne Rademacher, who allowed as how this was the first time he had given such a tour. We city slickers got a 90-minute education on how calves are tagged with a computer chip within 24 hours of birth, and tracked over the course of their lives. What, how much and when they eat are tracked with precision. There’s separate grazing pastures for first-time mothers and second-time mothers, feed lots for cattle awaiting slaughter, and a relatively good life for the cows lucky enough to survive as long as 13 years in government care. Wayne drove us into the doorway of a million-dollar shed where cattle come in for measured feedings – and know which of the long line of stalls is for them. Herds learn, when a gate is opened, to move from one pasture to the next in a planned rotation to assure healthy growth of grasses. “They know they’re moving to a better place,” Wayne said. 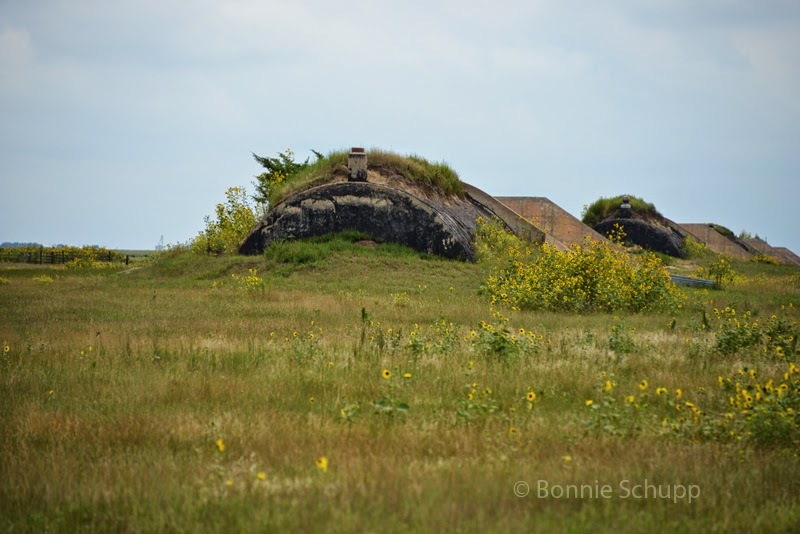 A curiosity across much of the property is the sight of hundreds of turf-topped bunkers made of thick concrete that were formerly used to store naval weaponry, including missiles. Some are used for storage, our guide said, but most appear to be empty. He said three take up the space of about an acre, and removing them would free up more land for the agricultural side of the operation. But that would also be expensive. So they dot the landscape for miles around. The center has about 7,500 cattle and 1,500 sheep, Wayne estimated. I forgot to ask about the hog population, but an informational packet handed to us at the administration building put the number at 400 sows. There’s even a corps of dogs to keep the sheep in line, and discourage coyotes from making them dinner on the hoof. 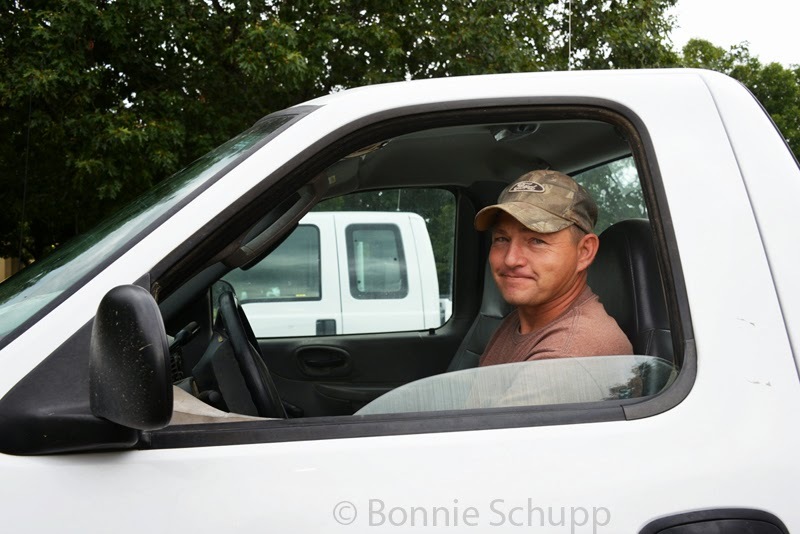 Wayne has been working there more than 20 years, managing cattle as a Nebraska state employee. The animals were owned until recently by the state government, but now are federal property. A few hours after our tour, we stopped for dinner. We ordered steak. Thanks, Uncle Sam! Earlier in the day, we stopped in the town of Aurora to visit a small but excellent museum called the Edgerton Explorit Center, named for the inventor of, among other things, the Stroboscope that enabled photographers to capture images never before possible such as a bullet in flight. Harold Edgerton – or Doc, as he was known – was a native of Aurora who went on to become a professor at the Massachusetts Institute of Technology, a friend and scientific participant in undersea exploration by Jacques Cousteau, and even photograph one of the early atomic bomb tests. He died in 1990, at age 86, and six months later his native community decided to establish the place in his honor where children, especially, could learn and be inspired to explore possibilities in science and technology. Admission for seniors is $5, and we did our best to act like kids – playing with its hands-on exhibits, even with toys in the gift shop, and marveling at the accomplishments of Doc Edgerton. Money well spent! Talk about flat! Some roads are so flat, the anti-abortion billboards can be seen from half a mile away. And with the placement of some billboards, it appears that Jesus walks on corn. There was even a cross spotted on the edge of a cornfield adjoining the driveway into an Adult Superstore hard by Exit 159 of Interstate 80 in Iowa. Laugh all you want, but I swear that corn was higher than the crops we’d observed for miles coming and going, so to speak. We suspect the cross was a response by a local farmer to the presence of the adult store, but it seems likely it only attracts more business. 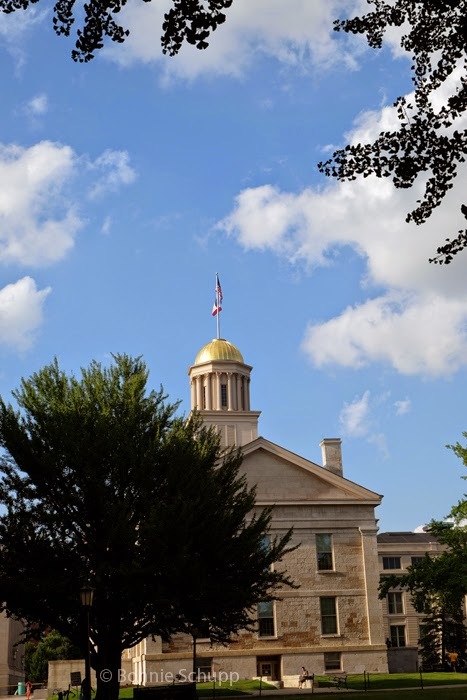 IOWA CITY – One of the challenges in a quick first-time exploration of a large state like Iowa is figuring out a route linking places of interest off the map and a little online research. 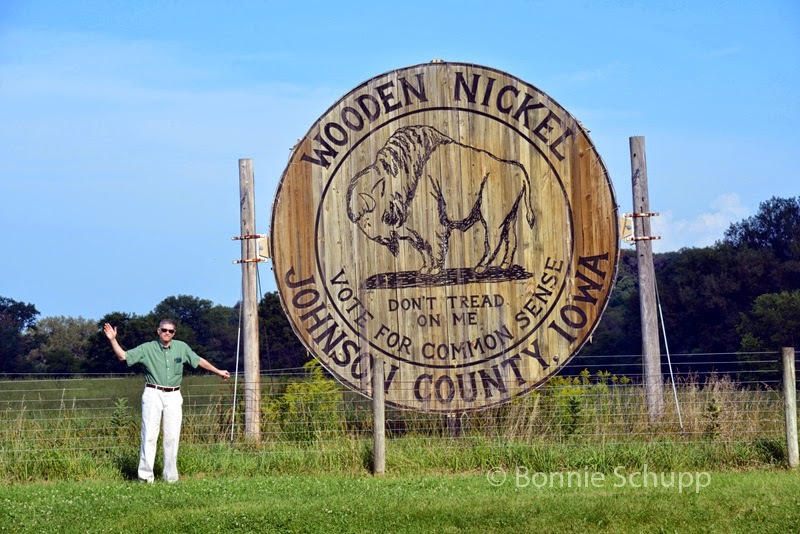 From Grant Wood country, we followed a looping journey through Cedar Rapids and Iowa City. Their communal life remained true for nearly 90 years, and the Amana Society still farms the land and owns various businesses, although only a relative handful of descendants of the original settlers remain as stakeholders. The best known Amana is the appliance business, dating to the 1930s but now owned by Whirlpool, according to the guide. It still operates in the area, and is the largest employer. In the Amana General Store (1858), we browsed shelves stocked with crafts, food products, confections and curios, and met a couple of retirees who are volunteers there – Myra and Keith Taylor, married since 1962 and amendable to taking part in Bonnie’s 40-Plus photography-and-words project focusing on what people see as the glue that keeps them together over the course of four decades and longer. 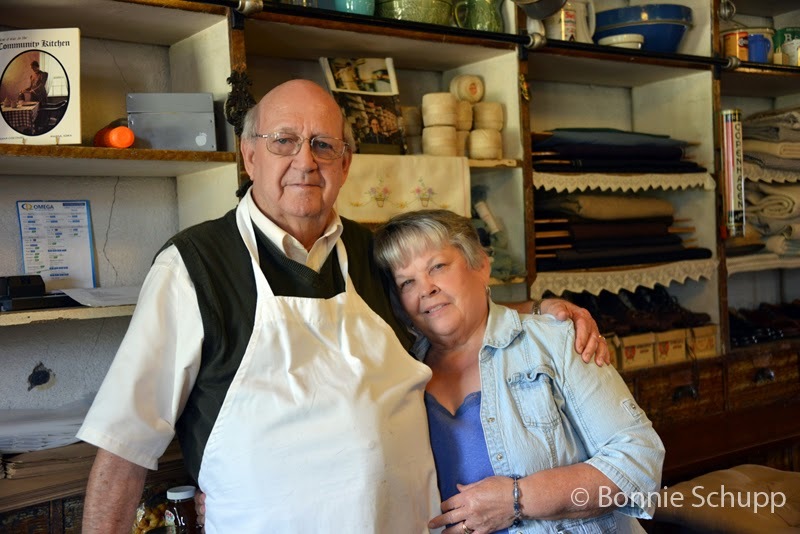 Bonnie took their photo portrait behind the store’s old wooden counter (above), and they helped us decide on a place for lunch – the Ronneburg, whose name comes from a German castle which had been an early settlement site for the early Inspirationists. We were not sure about heading next to Iowa City, particularly as we searched without success for an archaeological site where fossils were said to abound in suburban Coralville. For one thing, a new Marriott hotel and some highway construction had altered the area road configuration, rendering our old Tom Tom navigator’s instructions useless. But just then we heard back from a young Iowa City woman, Laura Kelly, who is local member of couchsurfing.com. Checking online, she found us a street address for the site along a French-named roadway that basically means Prairie Dog Boulevard. Along the way, we found a visitor center that had closed an hour earlier, but no dig site – and the address listing that was at least a mile away appeared to be in the middle of an inaccessible marsh. We did, however, find by accident what is reputed to be the world's largest wooden nickel, really a clever political message that reads, "Vote for common sense." But our new Couchsurfer friend, Laura, was amenable to getting together for a drink in Iowa City and suggested we meet outside the old Nebraska capitol – a gold-domed landmark that was first a territorial capitol and then the first state capitol, and now the centerpiece for the city’s dominant industry, the University of Iowa. It was the fall semester’s first day of classes, and the campus was bustling with activity. Alas, it was also the only day of the week that the old capitol building was closed to visitors, but I managed a peek inside and at the underside of the dome. I can report that the building is beautiful, but not as amazing as Maryland’s own Colonial-era State House. And George Washington never set foot in Iowa. In search of a restroom, I found my way into a nearby biology classroom building where the cool basement level was lined with the glass display cases that constitute the university’s very nifty natural history museum. 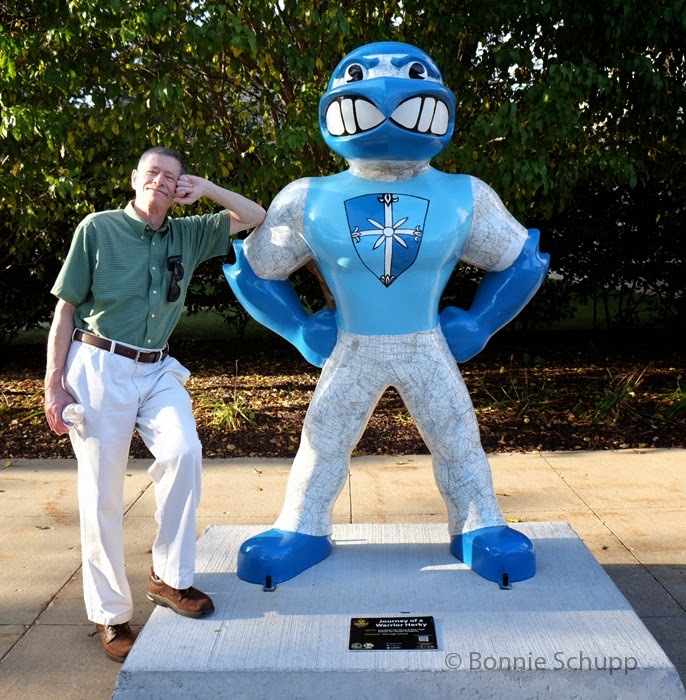 We walked around the neighborhood with Laura, stopping for my latest silly photo op with one of the many small statue depictions of school mascot Herky the Hawkeye and then a drink at a local saloon suggested by one of my Maryland-based Facebook friends – the Deadwood. It was a little early on the still-blazing hot evening for liquor, so we had some Cokes. My diet Coke, frankly, tasted like it came from a mix not up to standards. Maybe I should have opted for a beer. 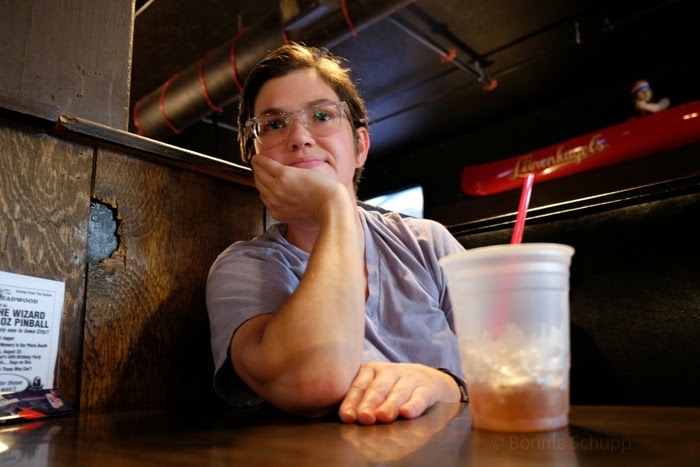 Laura, raised in Chicago but educated in and now enjoying life in Iowa, works with the disabled by day, and two nights a week – including this one – is employed overnight, when she gets paid mostly to sleep in the apartment of two visually-impaired adults. Since we had some miles to go before we slept, we walked back to our car with her and then bade our goodbyes. We, of course, extended an invitation to visit if she ever finds herself in the Baltimore area. And off we went, headed west on Interstate 80 again, aiming straight for Cornhusker country – Nebraska. 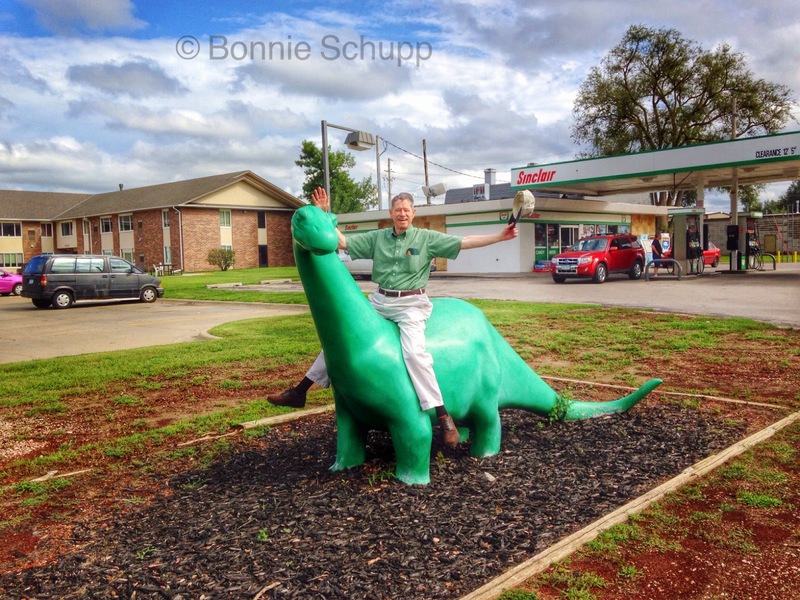 The next day, our first stop – and last in Iowa, on the outskirts of Council Bluffs – was a particular gasoline station, where the online search had turned up an old Sinclair dinosaur. Although it was a bit of a brontosaurus, it was not a very big one. But at about four feet in height, it was another David Photo Moment, as I climbed aboard and waved my cap like a rodeo rider about to survive eight seconds on a bucking bronco. Some say I am easily entertained. Yeah. 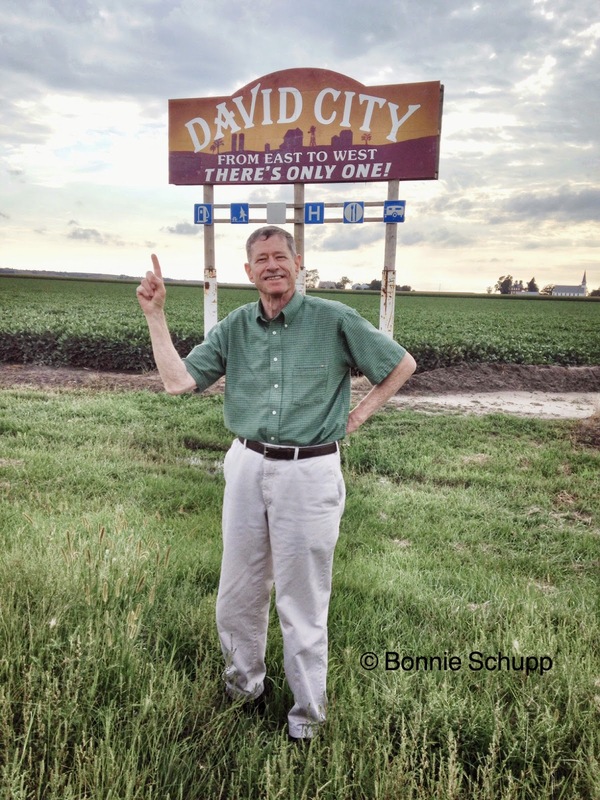 Then it was across the border, past Omaha and the towns of Fremont and tinier places (like Rogers, where the signpost cites a population of 82), until we saw the inevitable beckoning of a place to see: David City. Would you believe, more photo ops? Life on the road is so sweet!